A tumor composed of histiocytes. /his·tio·cyt·oma/ (his″te-o-si-to´mah) a tumor containing histiocytes (macrophages). benign fibrous histiocytoma any of a group of benign neoplasms occurring in the dermis and characterized by histiocytes and fibroblasts; the term sometimes encompasses several types of neoplasms, such as dermatofibroma, nodular subepidermal fibrosis, and sclerosing hemangioma and sometimes is synonymous with one of these. malignant fibrous histiocytoma any of a group of malignant neoplasms containing cells resembling histiocytes and fibroblasts. multiple, dermal histiocytic nodules in young dogs; no clinical significance, eventually disappear. 7,8 The benign fibrous histiocytoma is typically negative with CD34 and Bcl2. the testis is a very rare location for malignant fibrous histiocytoma (MFH). The initial biopsy had been considered most consistent with malignant fibrous histiocytoma, and melanoma had been ruled out on the basis of the S-100 and MART-1 stains being negative. 05 (b) Abbreviation: MFH, malignant fibrous histiocytoma. Differential diagnosis of GCT-ST includes soft tissue mesenchymal tumour which are rich in giant cell, villonodular sinuvitis, cellular dermatofibroma, atypical fibroxanthoma, plexiform fibrohistiocytic tumour, malignant fibrous histiocytoma, leiomyosarcoma, extraskeletal osteosarcoma and epithelioid sarcoma. Clinicopathologic analysis of 74 cases of a distinctive variant of cutaneous fibrous histiocytoma with frequent recurrence. This is what differentiates the lesions that is typical in some areas, in others resembles collagenizing vascular granulation tissue, deep fibrous histiocytoma, or fibromatosis. Malignant tumors developed from ABC are recognized as malignant fibrous histiocytoma or osteosarcoma [4-6]. It was, according to the final biopsy result, "low-grade malignant peripheral nerve sheath tumor," a "Myxoid Malignant Fibrous Histiocytoma (Myxofibrosarcoma) to be specific. 4,5] The common histological subtypes are malignant fibrous histiocytoma (MFH) (24%), leiomyosarcoma (21%), liposarcoma (19%), synovial sarcoma (12%) and malignant peripheral nerve sheath tumour (6%). 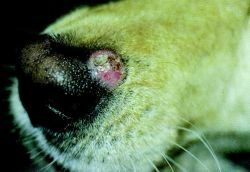 3The differential diagnosis of CS is made with other benign tumors of epidermal or mesenchymatous appendages such as dermoid or sebaceous cyst neurofibroma dermatofibroma basal cell carcinoma pilomatricoma histiocytoma and seborrheic keratosis. Canine Cutaneous Histiocytoma Is an Epidermotropic Langerhans Cell Histiocytosis That Expresses CD1 and Specific f32-lntegrin Molecules.